Quaint alleyways with Shikumen architectural townhouses converted into shops & restaurants. 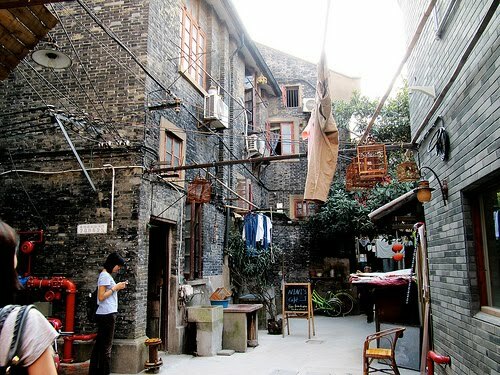 SOHO OF SHANGHAI. ART GALLERIES. BOUTIQUES. LAID-BACK CAFE CULTURE & ARTISAN RESTAURANTS. line 9: get off at Dapuqiao Station & take exit 1. * This fashionable neighborhood is constantly evolving and reinventing to the latest trends and fads. What is "in" one minute is "out" the next. Many of the restaurants and retail shops are also casualties of this and close down quickly. 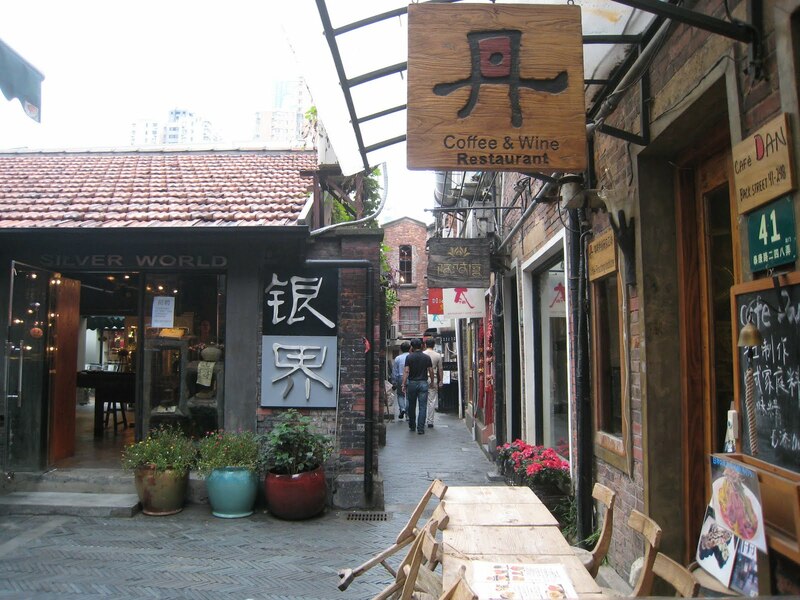 * In the back alley lanes of Taikang Lu, it is worth scoping out for not only its simple, yet tasty food and drinks, but also for its epicenter of Shanghai's creative quarter. 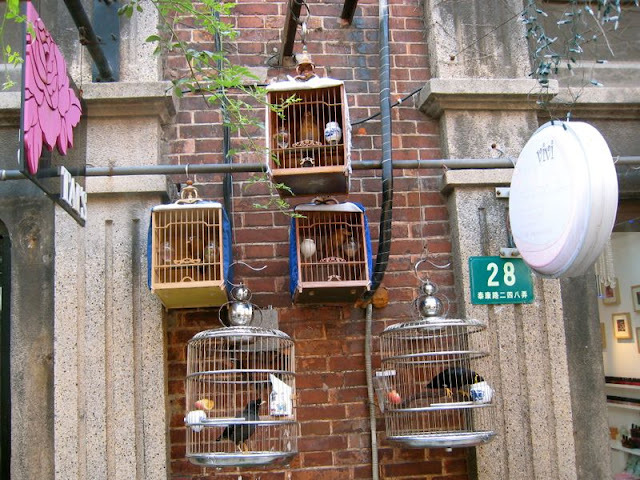 Outdoor seating is usually overflowing with artsy locals and hipster expats. Don't forget to check out the indoor and back courtyard. * Tratttoria style restaurant. 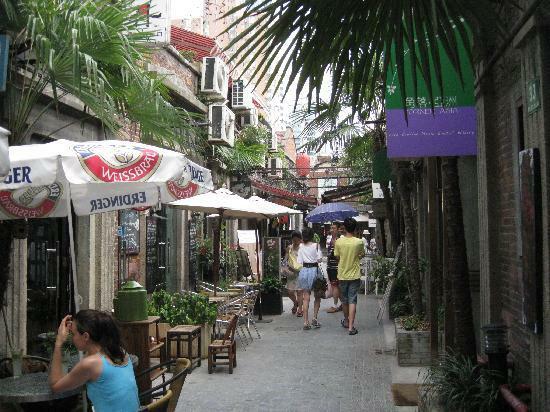 It has a terrace on the roof overlooking the Taikang Lu lane shops. Traditional home cooked meals. * This tucked away grill offers USDA Prime beef mainly of half-pound burgers and slabs of steak. 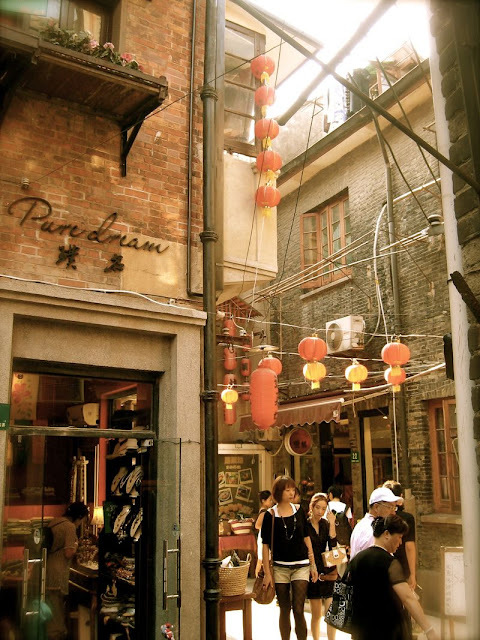 * Small laneway cafe. It serves vietnamese coffee. * Cafe restaurant serving up healthy dishes from breakfast to dinner. Minimal decor. * Serves Japanese comfort food and tea, wine and desserts. * Visitors can relax and escape the crowds in the cozy interior, or feast their eyes upon the bustle from the outdoor seating. Ideal for lunch, afternoon tea or evenings of relaxation. * Serves South East Asian dishes such as Vietnamese Banh Xeo Hue Turmeric Crepe filled with Shrimps, Chicken & Herbs amongst other favorites. * A multi-story Japanese bar and grill, with teppanyaki, robata, yakitori, and a pocket-sized bar on the top floor. They also have a few unique Okinawan dishes, which fall somewhere between common Chinese and Japanese cooking, and they serve awamori, an Okinawan rice liquor similar to shochu. * Coffee bar. Popular with the locals. * Cozy wine bar / restaurant with a great wine list. One of the few wine bars in Shanghai that retains the “old-Shanghai” feel. * Sells New Zealand goods: 42 below vodka, wines and furniture and gift items. * Kids fashion boutique by French designer in collaboration with Shanghai designer. * Offers an eclectic array of goods that don't fit neatly into one overall style of artificially distressed vintage-look couches, tables, and armoirs; Union Jack tote bags and wall hangings, etc. * Flagshop store of Boutique fashion designer Jenny Ji. * Boutique store selling clothing ranging from bathing suits to tailor made sneakers on the pricey end. All clothing designed by local designers. * Miao minority women hand embroider ethnic-flavoured cushions, clothing and bags. * Chain store selling clothes with the cartoon Hi Panda, hipster-ish clothing started and designed by local designers. * Sleek Finnish design products, such as home décor and lifestyle accessories. * Black & white photos capturing the soul of Shanghai.